Early this week was a special someone's birthday. As cliché as it may sound, but he is indeed the nicest guy I have known. He has always pushed me to be 'me', not to over think but to just follow my heart and to live my life on my terms. I am the kind of person, who needs that push and then am on a roll. He certainly provides more than a push. He loves desserts, but is picky, not the one to be blissful on a sugar high. Not crazy about frosting, and I don't have great piping skills to boast. But somehow a cake without frosting looks undressed, don't you think... something missing, so I wanted to bake something that would look a bit presentable and satisfy his sweet or should I say not so sweet tooth. I went around the blogospher and found the cake recipe here, (sugar is just perfect) now I wanted something to compliment the cake and make it from boring to glam... ( am talking about the glam version for a woman who cannot pipe). Thanks to David lebovitz, I made some candied oranges, recipe here. Paring them was perfect, a dollop of whipped cream and boy! It was a good cake. We had some close family friends who dropped in to surprise the birthday boy (I know, we have some amazing friends) and the cake was almost polished off, am glad I could save a couple of pieces for you guys. The candied oranges had a hint, just a hint of bitterness with the sweet, which I loved. 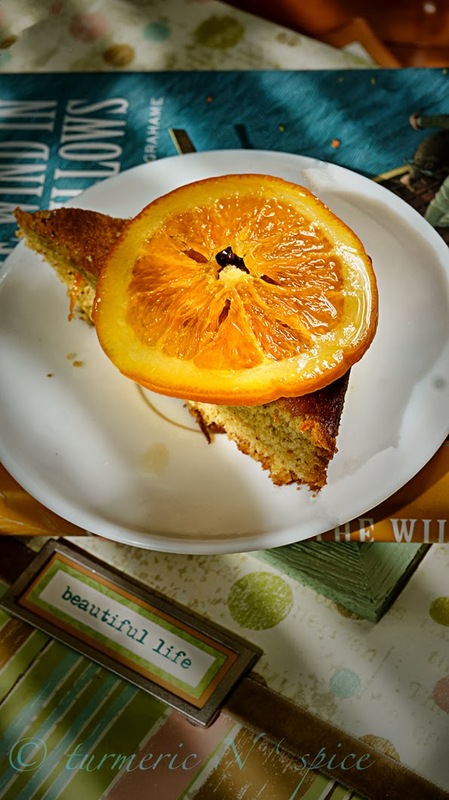 So I styled the cake with some whipped cream and a small piece of the candied orange ( if you do not like candied oranges) and the other one with just a big generous helping of the candied orange. While my oven preheated to 375 degrees (F). Cream the butter and the granulated white sugar using the paddle attachment in my stand mixer (you could just as easily make this cake with a hand-held electric beater too). Then add the eggs, oil, vanilla, orange zest, and orange juice, and beat well until smooth. In a separate mixing bowl, combine the flour, baking powder, baking soda, salt, cinnamon and cloves. Add the dry ingredients gradually to the wet ingredients and the finished batter until incorporated . Pour the batter into well-greased 8X8 baking dish and smoothed out to evenly fill the pan. Bake in the centre of the oven until a toothpick inserted in the centre came out clean (about 30-35 minutes). To candy the oranges, cut the orange into 1/4-inch slices. Put the slices in a saucepan, and add enough water to cover them well, and bring to a simmer. Blanche the slices for ten minutes, then drain well. Put the oranges back in the saucepan and add the 2/3 cup sugar and 2/3 cup water and cook the oranges at a simmer for about 10-12 minutes, or until they are tender and translucent. 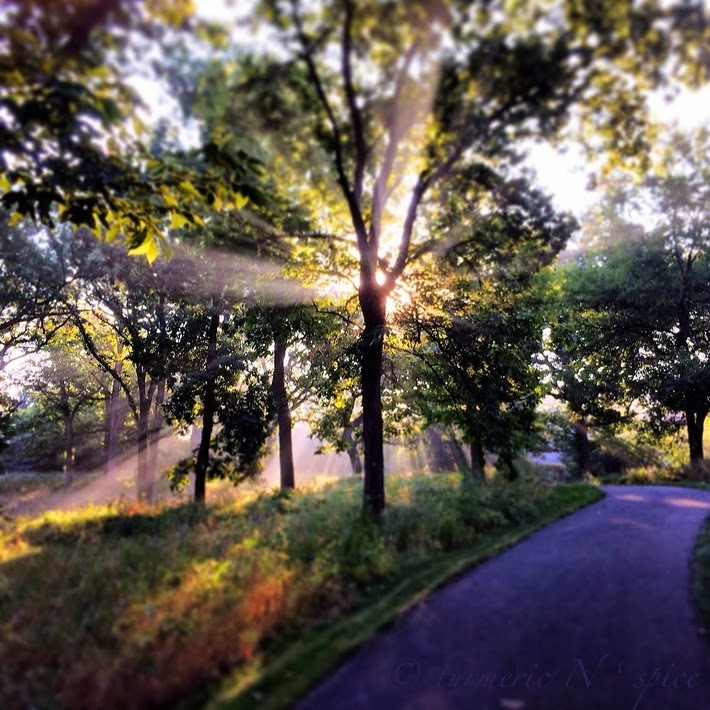 iphoneography, on my morning walk... breathless right! Omg, cake looks absolutely incredible...Love that fabulous slice. What an amazing looking cake! I love citrus of all kinds, so I know I'd love this delicious treat. YUM! Me too Amy, I love citrus. 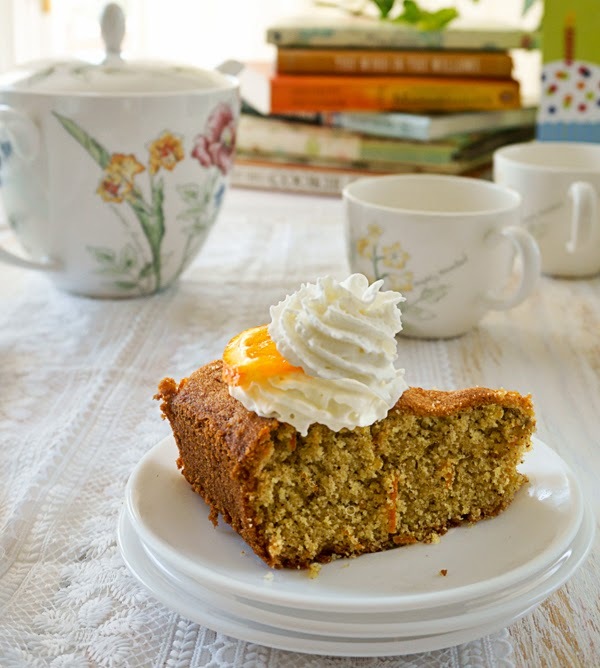 Love the photos and the delicious flavors in your cake! 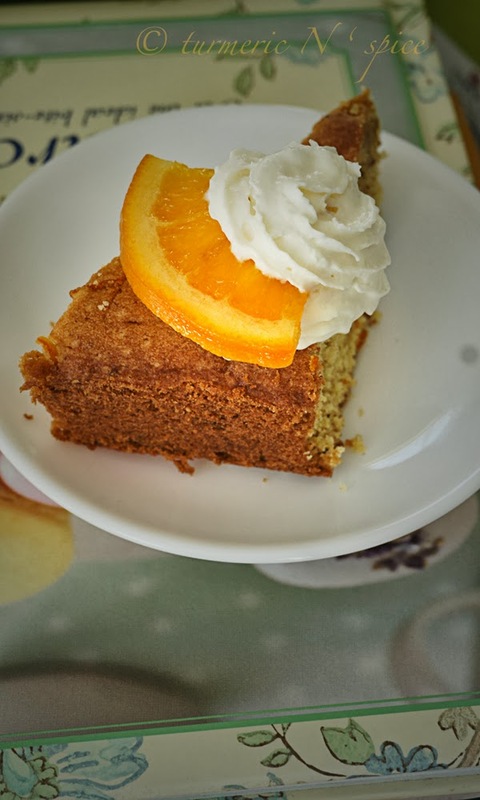 Simply delicious and mouthwatering orange spice cake. Photos looks simply great. Mmmmm......This cake looks so delicious. Looks like it would simply melt in my mouth. It was a very moist cake. Very nice Blog, Thanks for sharing this..
A delightful cake! So flavorful and enjoyable. Those iPhone shots are gorgeous. Simi, happy birthday to your hubby and no it doesn't sound cliched at all. We are not big fans of frosting so this cake is perfect. I am up for anything that has hint of orange in it. The first photo exude so much warmth and the cake itself is simply gorgeous. 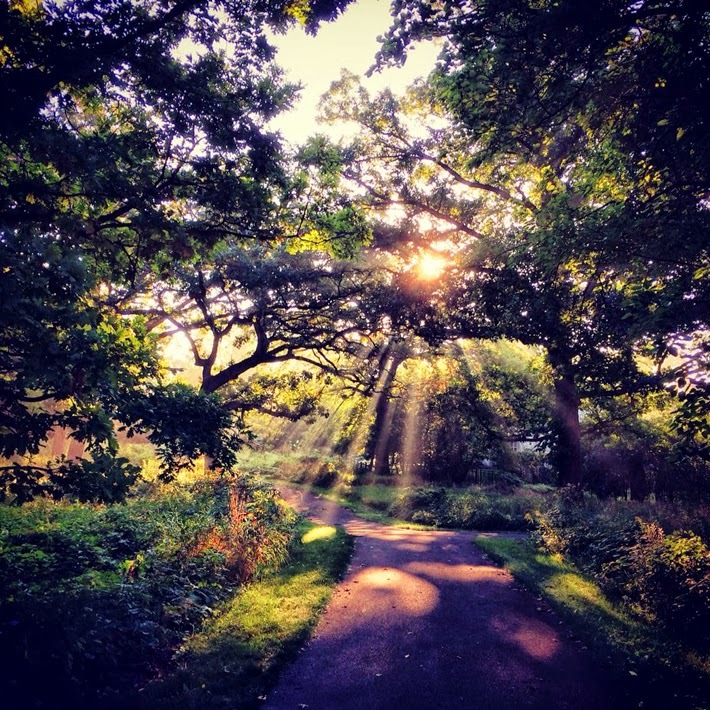 the morning walk photos are simply beautiful ! Wow!!! 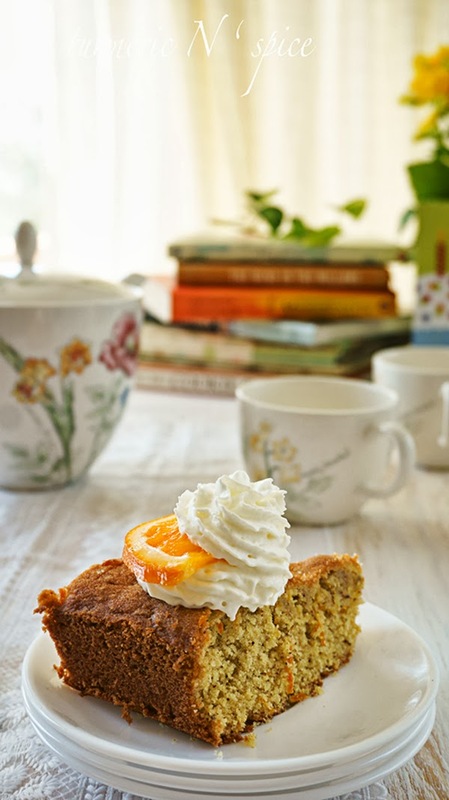 What gorgeous pictures...and absolutely delightful orange cake!!!! The cake looks scrumptious. I love that you even made your own candied orange. Irresistible! The morning walk photos are stunning! That candied orange is so aesthetically appealing. Very nice post! And really nice recipe - my mom used to bake something a little bit similar to this. One of my favorite cakes when I was young! Good stuff - thanks. 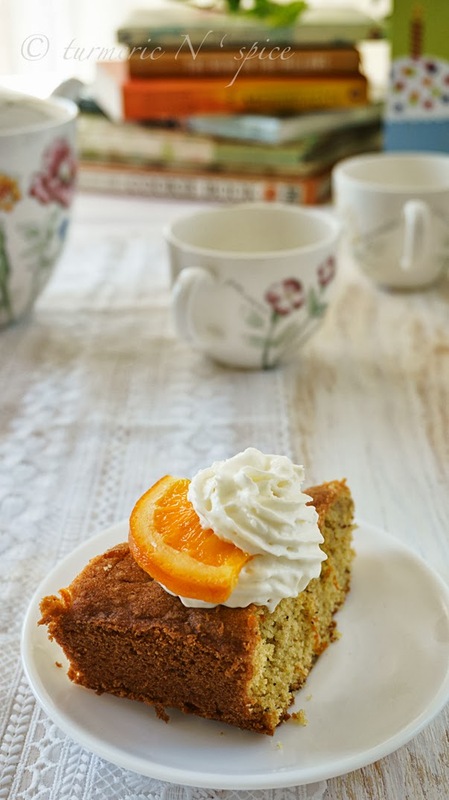 I love oranges in my baked goods and even desserts and this cake is looking so good and tempting. I got to bake this soon.